Patience and loyalty two feet angle, Nazarudin Baba; emerging champions Kategori Laut Karnival GP Joran's serial 2007 and Samsuri Sulaiman, from Sungai Balang, Muar, proven Johore worth when respectively driving return sponsorship Perodua ViVA Perusahaan Otomobil Kedua Sdn Bhd (Perodua). Nazarudin and Samsuri declared whole series champion Karnival GP Joran 2007 respectively as Kategori Laut and Kategori Pantai to closing ceremony the competition final in Pantai Teluk Kalong, Kijal, near Kemaman, Terengganu 27th of October go. 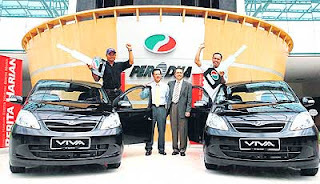 The hot stuff respectively collected 77 eye and 62 eye simultaneously qualify them win worth Perodua ViVA RM40,000 every a.
Ganas blog ko skarang nie!!! Fishing Information,fishing tips,fishing tools ,destination fishing vacation,seafood and altogether about fish.Maklumat Memancing,Tip-tip Memancing ,Alat-alat Memancing ,Destinasi Percutian Memancing ,Makanan Laut dan Keseluruhannya Tentang Pancing dan Ikan. Do not missed the new tips. Please put your email in the box.